This magazine is dedicated to the most popular and exciting Japanese puzzles, Killer Sudoku. Buy a single copy or subscription to Killer Sudoku magazine. This stands out to be the would-be successors to Sudoku. 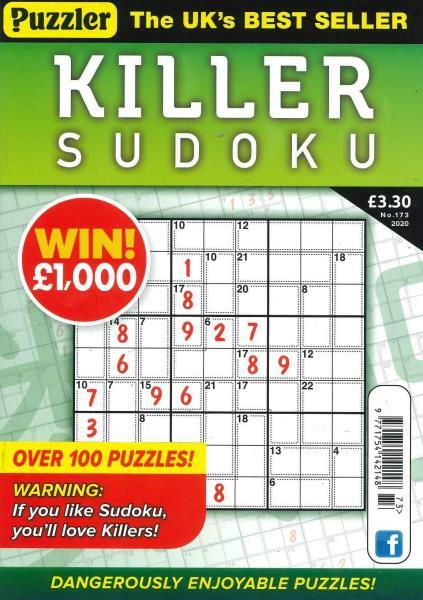 Killer Sudoku first made its appearance in 2005. In this game, all the rules of the Sudoku puzzle are applied, but the normal Sudoku is overlaid with a number of irregular mosaic cages making it an even more interesting puzzle. The sum of the digits of each cage must be equal to the small number that is placed in the top corner of that particular cage in the grid. The magazine, with roughly 50 pages in a single issue, contains sixty killers, five kakuro, three Nurikabe, and Hidoku puzzles. These puzzles are classified into 5 levels, namely, mild, medium, tricky, extreme and deadly. Each issue gets you a pencil for free! It is printed in the best colors featuring puzzles which are fascinating and keeps you glued to the magazine. Killer Sudoku presents a lot more fun and entertainment than the normal Sudoku acting as a challenge for the readers to enhance their skills. I LOVE killer sudoku. It's much more interesting and challenging than regular sudoku. I like the progression through the book although to make it perfect for me I'd like fewer easy ones and a few more really hard ones - but that's only my preference!